Sara’s Filigree ornament is based on my Sara table center design. The ornament is a way for stitchers to be able to work a small taste of the design without taking a four-day class or for those who are not advanced in skills. 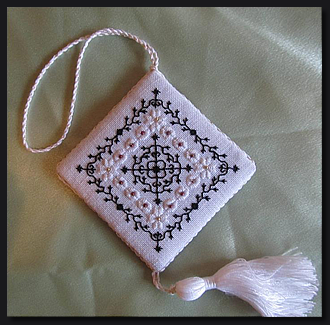 It is worked in Blackwork and satin stitches with a few beads to give it sparkle. 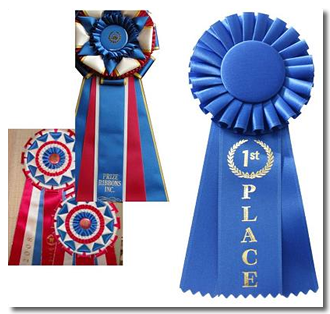 Finishing instructions will be included and covered in class, but finishing materials will not be included. Kit Contents: 28 count white Cashel Linen. DMC Pearl Cotton #8 and #12, DMC Flouche, Mill Hill Glass Seed Beads, Tapestry needles, instructions. Student Provides: small, sharp scissors; 6” hoop or QSnap™ or similar sized stretcher bars, lighting/magnification needed, usual stitching tools. 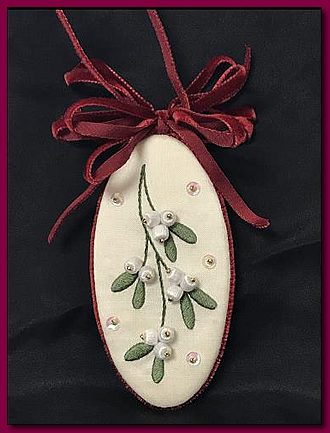 Remember sweet kisses under the mistletoe while you create this elegant Stumpwork ornament. Snow white wrapped berries nestle gently against padded leaves. Red velvet ribbon tied festively into a bow tops it all. Design Area: 1 1/2" x 3 1/2"
Kit Contents: Instructions, silk shantung, cotton fabric, stranded cotton thread, beads, felt, needles, and finishing supplies. Student Provides: 6” embroidery hoop, scissors for cutting fabric and felt, acid free glue stick, white tissue paper, cream colored sewing thread to match background fabric, and usual stitching supplies. Magnification is highly recommended. Did you ever wish you knew how to make those wonderful beaded name tags that people wear to seminar? Here is your chance to learn tubular peyote. Yes, underneath all those cute little bells is tubular peyote. 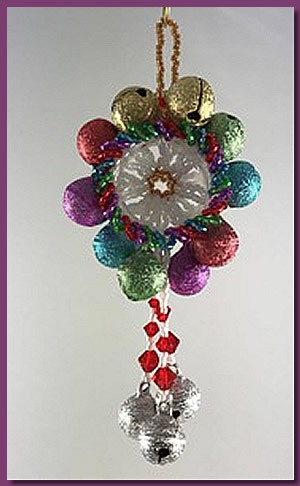 Learn the basics while making this tinkling Christmas ornament. Design Area: 3" x 1"
Kit Contents: all Delica beads, Swarovski’s, embellishments, needles, threads and instructions necessary complete the project. 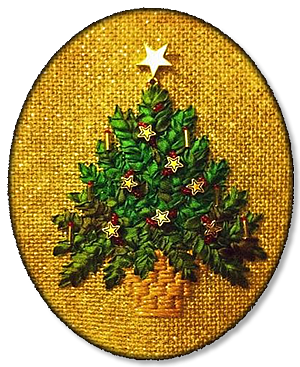 Join me in stitching this beginning silk ribbon embroidery Christmas Tree project for the Holidays! 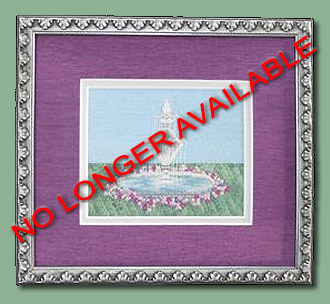 The 18-count canvas background is hand-painted with metallic paints. The design uses River Silks 4mm overdyed silk ribbon, Neon Rays plus metallic ribbon, and is embellished with a gold star, gold star beads, red seed and petite beads, and gold bugle beads. The finished piece can be matted and framed or finished as an ornament. Design Area: 5" x 4"
Kit Contents: Complete thread kit, with embellishments, needles, hand-painted and taped 18-count canvas with line drawing, instructions, including a large picture of the design, detail photos, drawings, a stitch guide and tips on handling silk ribbon with a short history of the Christmas Tree. Student Provides: 10” x 10” stretcher bars, frame or hoop, tacks or staples and usual stitching supplies including a laying tool, stand/frame weight/or clamp for hands-free stitching. Light and magnification (optional). A bunny sits on a colored earth, spying on the nearby gardens. This is a small companion piece complementing the vegetable series including Carrots, Radishes, and Beets. 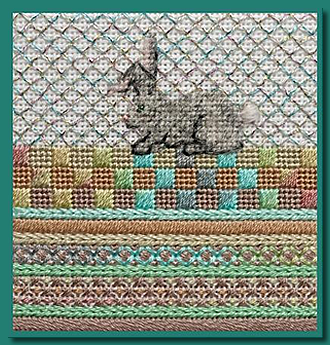 Either framed, or finished as a scissor fob or pin cushion, the bunny tends to your garden of stitching. Design Area: 2 1/2" x 2 1/2"
Kit Contents: Kit Contents: White Congress cloth 6” x 6”, stretcher bars to match canvas, Caron Waterlilies, Rainbow Gallery Whisper, Rainbow Gallery Santa’s Beard, Accentuate, Variety of DMC Cotton Floss, Instructions. Dogwood Posey uses Stumpwork techniques to create a 3-dimensional sculpture free of ground fabric. 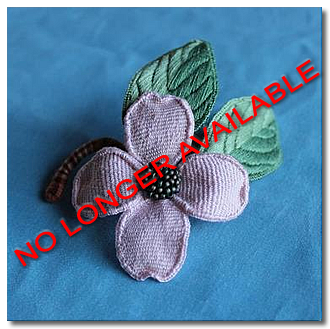 The completed piece is small enough to wear as a lapel pin. Ambitious students will have sufficient materials to make additional flowers and leaves to create a branch. Kit Contents: 3 stranded cottons, DMC Color Variations, tatting thread, bobbin of sewing thread, needles, bar pin, broadcloth, silk backed by muslin, seed beads, 28-gauge wire, graphite paper, needle lace pad, detailed instructions. Student Provides: 3 or 4-inch hoop, usual stitching supplies including 12” ruler, scissors for silk fabric, magnification, if desired, pencil, sandpaper, thimble, and optional: small jeweler’s pliers with cutting edge or tiny wire cutters. This is a mini project on 18 count canvas. The purpose of the project is to teach analogous colors and small stitches that can be used to express flowers in any of your projects, or on painted canvases. Someone out there will love your embroidery! This course will teach you how to find exhibition opportunities, adhere to requirements, set a pace for preparations, write the (dreaded) artist statement, and protect your work when mailing it. Learn to recognize valid critiques and find the nugget of learning in them. Go behind the scenes to see how exhibits are planned, set up, and returned. Learn secrets of photographing embroidery with a digital camera. Student Provides: Choose two or three embroidered works for photography and/or critique demonstrations. If you are flying, you can bring unframed works (no glass, please), but all the stitching should be complete. They do not have to be original designs. 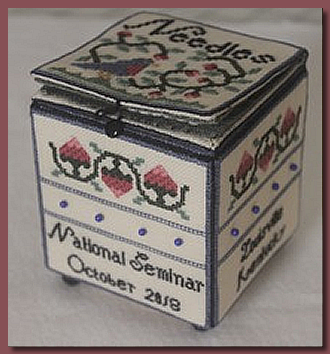 This 3” cube houses your needles, pins and scissors and will be a lovely and useful memento of you time at the SCR seminar. The top of the cube is a needle book. Three sides are stitched with strawberry vines – each worked in a different group of counted stitches – and your personalization. The fourth side of the cube has a scissors sheath to house a wee pair of scissors. The bottom has space to stitch your name. Tesoritos means “tiny treasure” in Spanish. 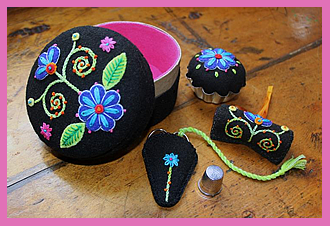 This miniature sewing box includes a pincushion inside a tart tin, a mini needle roll, and a scissors sheath and fob. Procedures in felted wool applique including tack stitch methods, the teacher’s signature needle slanting techniques, surface embroidery tips and easy & accurate buttonhole stitching will be presented. Kit Contents: Black felted wool, Weeks Dye Works felted wool, Weeks Dye Works wool threads, silk ribbon, Vineyard thread, DMC Perle cotton #8, needles, freezer paper, tissue paper, full-size pattern, directions, acetate for placement guide, tart tin, 4-inch paper Mache box.